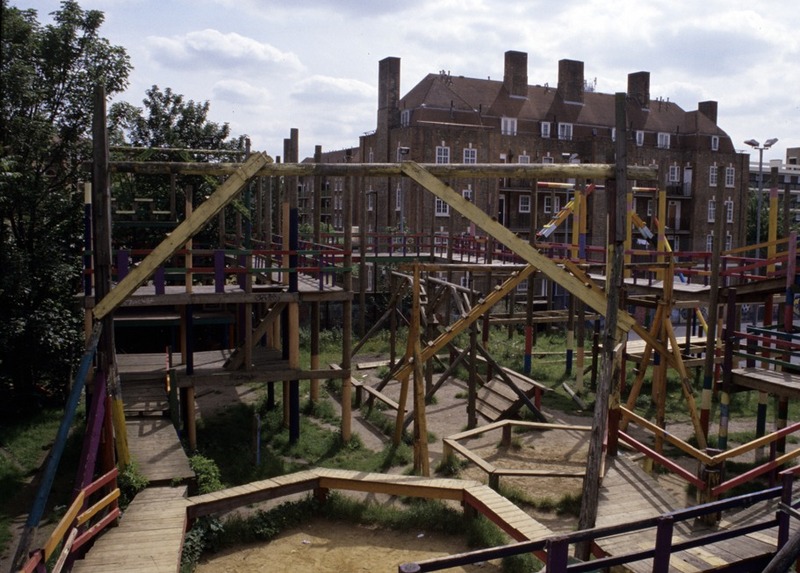 Deptford Adventure Playground was built on the site of on old slaughterhouse and a dairy that were destroyed during the Second World War. The playground started in 1963 and old bottle tops from the dairy can still be found when digging. Possessing some of the tallest play structures in London, a crazy complex of three tiered walkways, ramps and swings are packed into an empty lot between buildings. There are trees and bushes growing between and around platforms and bridges. The high build is mitigated by platforms that ensure no fall is greater than seven feet. This playground was last visited and photographed in 2003.